Learn more about the next God Eater in just over a month. New information about the next God Eater game will be released at the God Eater Orchestra Live concert on October 7 at Pacifico Yokohama, the latest trailer for the event reveals. 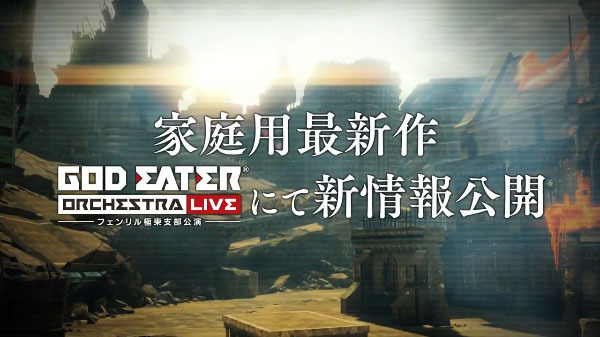 Speaking during a Niconico live stream earlier, where the trailer first debuted, God Eater series general director Hiroshi Yoshimura and God Eater New Project producer Yuya Tomiyama said that while we have only received tidbits of information in the past, a sufficient amount of information will be released this time. The new God Eater game was first announced at Tokyo Game Show 2016. It has since seen one new teaser trailer, which was released in March. It is planned for release worldwide. Watch the God Eater Orchestra Live trailer below.